If you’ve ever dreamed about being one of the sun-bleached and tanned cadre of New York City surfers, there is no better time to get started. Hurricane Sandy ripped apart the Rockaways and there is still no boardwalk along the beachfront, but the waves are rolling in one perfect break after another and the surfers are out, their lean bodies looking beautiful in black wetsuits. 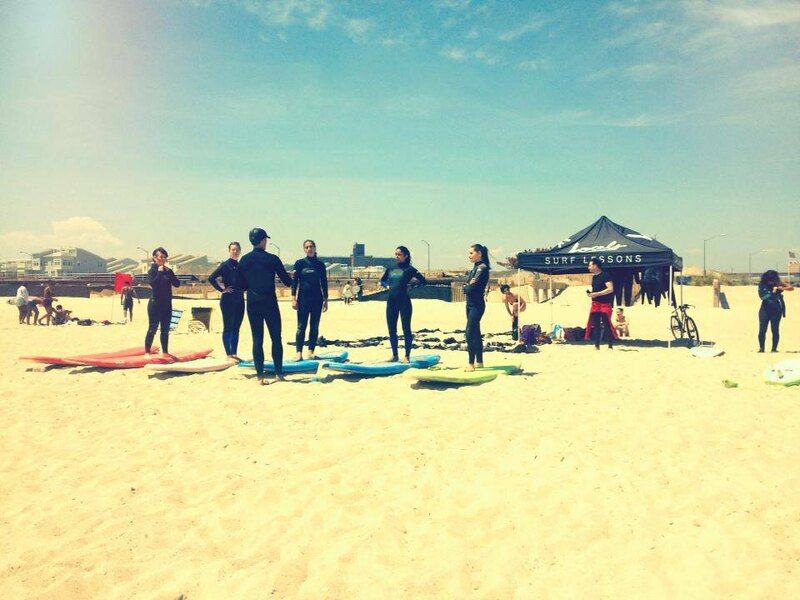 So now is the time to learn to surf in the Rockaways. Go now, go while there are still makeshift roadblocks and broken-down houses, go to remind the natives while they live so close to the shoreline, why they spent months carrying sand out of their basements and powering their homes with generators. Locals Surf School is run by Mike Reinhardt and Mike Kololyan, two Rockaway natives who have been friends since they were just kids hauling surfboards bigger than them down to the shoreline. They both weathered Hurricane Sandy in their Rockaway homes. Mike R helped his dad sandbag the basement and Mike K got trapped in a neighbor’s apartment after he went searching for candles. Both saw the ocean they love fill their streets, tear down homes and flood basements, only to leave behind chaos and mold. A shitload of mold. I booked a lesson with them on one of the rare sunny Saturdays this past April. [Full disclosure: I paid the full $100 private lesson fee, since I hadn’t planned on writing about them.] I was worried they would be super cool surfer dudes who would intimidate the hell out of me, but when they showed up they were just two lovable guys who barely topped my 5’8” frame. Mike R has the bleached blond hair, blue-eyed and tanned skin of a pro surfer, while Mike K is the loose-limbed, bearded, fun guy who possesses all the slapstick humor of your favorite camp counselor. To put it plainly, Mike K is the Jerry Lewis to Mike R’s Dean Martin. We spent about 30 minutes on the shore working on the basics - everything from how to get up on the board to how to fall off, which is pretty important if you like your body. Then I spent an hour out in the water on a foam surfboard so durable that I could have stood on it as I floated away from the wreckage of the Titanic, but whatever, I stood up twice and it was fantastic and Mike R and Mike K are the greatest cheering squad you’ll ever encounter. So go now and surf in solidarity!